There are a number of competitions and events held throughout the year. To participate in competitions you must be a member of Australian Canoeing (AC). To be a member of AC you need to be a full (competing) member of a Victorian canoe club. Charges vary between canoe clubs, so it is recommended that you select a club that suits your needs. If you want to try Canoe Polo before committing to a membership there are a number of training and introductory sessions available either independently or through canoe clubs. It is well worth contacting the clubs for more information. Canoe Polo can be played on any section of flat water. This includes rivers, pools and lakes. The Melbourne competition is held at Richmond Recreation Centre. 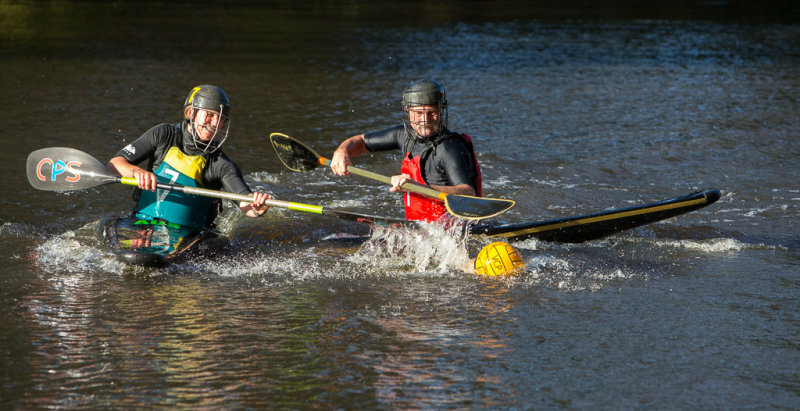 Weekend competitions are held throughout the year with common locations being the Yarra River at Studley Park/Yarrabend Park and the Maribyrnong River at the Essendon Canoe Club. What happens if you flip upside down? This is known as capsizing. When a person capsizes they have the option to either exit the kayak (bailing) or to roll back up again (eskimo roll). People can learn to eskimo roll in a safe pool environment, and this can become quite a useful skill in games. Why isn’t it called Kayak Polo? Canoe Polo has evolved from some basic games played in canoes or on barrels into the game it is today. When it was first played in Australia in the 1950’s, it was played in a double canoe with one person paddling and the other handling the ball. The sport has been modified over several decades and while the vessels changed to kayaks, the name Canoe Polo is here to stay. For more information on the history of Canoe Polo see the link ‘Polo History’. Kayak “Polo Bat” – There are specially designed kayaks available with rounded ends and soft rubber bumpers. They are relatively small being no larger than 3m long, with great manoeuvrability. Paddle – A double-bladed paddle which can come in various shapes and materials. Helmet – Helmets which come with face masks are essential as they protect the user from wayward paddles and balls. Personal Flotation Device (PFD) – This device gives the user protection around their torso as it is generally more padded than many other styles of PFD. Spraydeck – This is a flexible covering which attaches around the opening of the kayak to prevent water from entering. In most cases this equipment can be borrowed from your canoe club, hired, or purchased. As previously mentioned, to compete you must be a member of a Victorian canoe club as well as Australian Canoeing (AC). AC membership costs are $80 for adults or $57 for juniors. Canoe club membership fees vary. Additional costs include those of team fees on a per competition basis. These fees cover pool hire costs. You must also consider whether you will be borrowing, hiring or purchasing equipment.